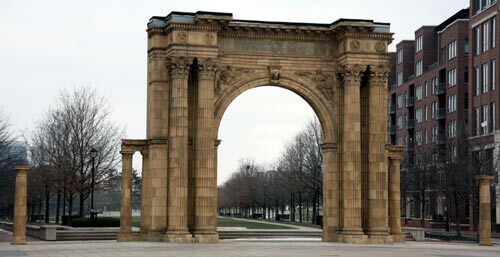 Sitting in place of importance in the Arena District at one end of McFerson Commons, the Union Station Arch is a testament to our historic past and those few remaining remnants of a building that once played an important role in the development of Columbus. 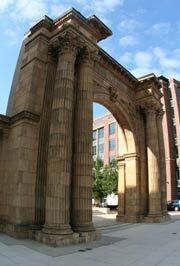 While the Arch is a symbolic gesture, it is a far cry for the original Union Station Arcade. Made of terra cotta facing, the Union Station Arch almost fell to the wrecking ball like the rest of Union Station if it wasn't for the efforts of a few historically-minded and dedicated individuals. Union Station had outlived its usefulness to Columbus by 1976. Plans were being developed for the new Convention Center and the Hyatt Hotel by an organization called the Battelle Commons. The Ohio Historical Society had been discussing with Battelle Commons on saving the Union Station Arcade (the Arcade was that section of the station that faced High Street). The Arcade had been listed on the National Register of Historic Places by the federal government's Department of Interior. In October 1976 discussions had been ongoing on ways the Arcade could be saved. These discussions were being held between the Historical Society and the Battelle Commons Board of Trustees. On October 19 the Board decided they could not afford the price tag for dismantling the historic Arcade. On the evening of October 22, the wrecking crews came to the station and started dismantling the entire station with a wrecking ball. Unaware that Battelle Commons had decided not to pursue any save any part of the Union Station Arcade, the Historical Society was caught off-guard when they saw the demolition on the local news that night. On Saturday morning, October 23, prosecuting Franklin County prosecuting attorney George Smith, who was a supporter of the Historical Society, visited the site after hearing the news the night before. Fortunately, overnight some heavy rains slowed the progress of the wrecking crew. 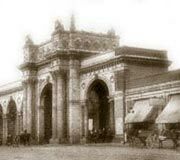 When Smith arrived at the site, almost everything of the Arcade was in rubble, except for the Arch. The night before, Smith had contacted a former associate, attorney William Brownfield, and asked him if he would take the case. It was Brownfield who found a judge on that Saturday morning in October to issue a temporary restraining order. Unfortunately, that Saturday was also an OSU home football game day and most of the judges in town were at the game. But Brownfield continued searching for an available judge until he finally located Judge George Tyack. Judge Tyack signed the temporary order to halt demolition and it was then delivered to the demolition site where the demolition crew were only minutes away from tearing down the one remaining arch. Over the next few days, the arch was dismantled and stored in a vacant lot. It was erected a short time later at Marconi Boulevard and Hickory Street. 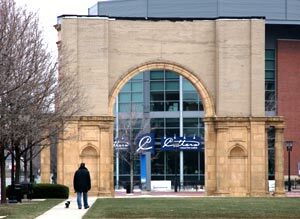 When Nationwide Arena was built, the arch was once again dismantled and then re-erected at its current location on Nationwide Boulevard, across the street from Nationwide Arena. Built in 1897, Union Station #3 was designed In 1893 by the architectural firm of Daniel H. Burnham & Company of Chicago.